What a mess this album is, like it was made by a bunch of stinky, sweaty, dried out alcohol bums dolted by delirium tremens, who camped out in a makeshift shack for a studio, using busted gear, bad hand-me-down microphones failing to sweeten the worn-out drones of old strings and second hand skins played a tick off beat, barely adhering to the rules of intonation, and completely out of touch with anything resembling today’s relevant styles. Just the singer himself sounds like he should have cut his losses a quarter century ago and found a profession that better suited him. Actually strike that, I’m not sure he ever had the true capacity to sing pleasantly for the edification of the human ear. His grumbles and moans sound like air being forced through a set of torn and tired bellows clamoring to be retired. …and these and other reasons are why Ray Wylie Hubbard is so beloved, why he’s so uniquely qualified to capture the low down no good side of life, and can make dusty moans and downtrodden tunes sound like divine harmony. Ray Wylie Hubbard says himself on this record that ain’t nobody in the halls of commercial enterprise looking for his style of arcane country folk blues. But that’s okay, it just means more heaping helpings for the rest of us who don’t want to partake in whatever is being served up by the evildoers programming pop culture. Ray Wylie Hubbard is just the type of stripped back, served raw, powerful and potent stuff that true roots music fans seek out. Complain all day this music is not relevant. But there is a reason acts like Eric Church and The Cadillac Three are name dropping Ray Wylie Hubbard and asking him to share the stage with them. It’s because when you start digging deeper into the modes and styles of American music, you discover crusty old criminally-overlooked guys like Ray infer even the most popular stuff. Ray is the kind of cool everyone wants to be, but few have the cred, stories, and skins on the wall to capture. 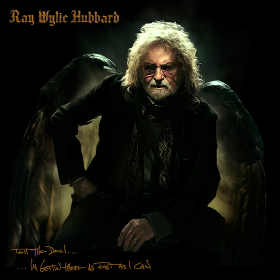 It’s a fair criticism to say that the modern incarnation of Ray Wylie Hubbard is primarily concerned with incantations about vintage musical gear and the battle between good and evil in the carnal world. He’s gone from the “Forgotten Outlaw” to a guy who would make a great tour guide through either a vintage guitar shop, or the scripts of the Old Testament. The sameness of the material may be a bit tedious for the neophyte roots music listener. 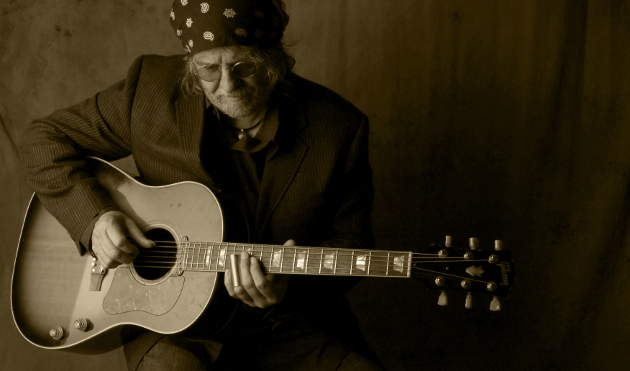 But adhering to the maxim of singing about what you know about, and specializing in a discipline that fits your strengths, Ray Wylie’s determined that the dead thumb blues and the trial and tribulations of the human soul on earth are what best fit within his now 70-year-old frame. Even folks with an elevated understanding of music couldn’t tell you what an “ES-335” or a “VOX AC-30” are, rendering some of Ray’s music as too esoteric for the common ear. But that’s part of the beauty of it. If you can’t perform for the masses, at least you can speak to those who do in a language they understand and respect. If anything, on Tell The Devil I’m Gettin’ There As Fast As I Can, Ray Wylie Hubbard doubles down on the approach of his recent records. “God Looked Around” is a direct retelling of the story of Genesis. “Open G” is probably about the most dedicated recitation of how to tune a guitar you will hear in a song. Ray Wylie Hubbard can get away with singing about the same subject matter because his songwriting is so damn good. The characters he creates and the scenarios he puts them in stimulate a theater of the mind and escapism of the body like few others, while still feeling like they all come in some version of events from the nine lives of Hubbard himself. He’ll pull out a song like the ghost story “House of the White Rose Bouquet” and absolutely blow your mind. He’ll tell stories of the low down and downtrodden, and make them sound like superheroes like in “Lucifer and the Fallen Angels” and “Old Wolf.” But these songs don’t come from some strange marvel that Ray Wylie Hubbard has with the evil side of life, they shine a light on how the shades between good and evil are much more subtle than they’re given credit for, and how we’re all simply one decision away from a fall from grace, or a shot at redemption. That’s why just like his previous two albums, Tell The Devil concludes with material much closer to hymn than accounts of hellish behavior. Hubbard’s output from the last decade is like a detailed account of events to St. Peter in hopes that his honesty and repentant stance will result in a golden ticket. 70-year-old guys without super hits on their resume are not supposed to be as revered as Ray Wylie Hubbard is by his musical peers, or just hitting their stride creatively. But that is the strange, inverted, winding road Ray Wylie Hubbard has taken to christening himself a living legend in almost universal acceptance, at least for the folks who’ve heard of him. Can’t wait to see him in about a month, and hearing stuff from this album. Now that’s capital “S” Songwriting. (1) I was a little disappointed with this album – hopefully that changes with more listens. (2) I hope this album truly closes out the trilogy (Grifter’s Hymnal, Ruffian’s Misfortune, Tell the Devil). It has given us some great stuff, but I feel it’s run its course and I hope he moves on. I thought releasing the title track of this album as the first song was sort of a bad move, because it played right into the criticisms about how Ray’s music recently has worked off the same basic themes. I get it, it’s the duet with Lucinda Williams and it will create a lot of buzz, but Lucinda’s contribution was just kind of sloppy, and Ray’s gear mentions made it ripe for criticism. But I found this record to deliver a lot more than I was expecting, and this is from someone who didn’t even officially review “Ruffian’s Misfortune,” not because I didn’t think it was any good necessarily, but I just failed to find the inspiration in it (though I did nominate “Stone Blind Horse” for Song of the Year.) I say all of this to say that I had trepidations early too, but in my opinion, Ray really delivered with the songwriting on this record. Are you gonna review the new Josh Abbott Band album? this sounds really interesting! thanks! Trig, surprised you didn’t like Ruffians Misfortune….my opinion… its one of his best. Listening to this album, not sure how I would rank it yet, but….will see him play any time he shows in PDX….classic artist. Was glad we flew to Austin for his 70’th…trying to scrounge the cash to go to his 71’st. I was undewhelmed by it at first, mainly because I thought it wasn’t as good as Grifter’s Hymnal, which was my favorite album of its year. But it grew on me. And Stone Blind Horses is indeed a classic. I feel similarly about John Hiatt’s Stoln Moments, which followed the great Slow Turning album. It just took a while. If I were stranded on a desert island and had to choose only one artist to listen to, I’d be hard put to pick anyone over John Hiatt. Yeah again, I wouldn’t say that I didn’t like it. I just didn’t feel inspired enough to write about it. There’s a difference there, though I can understand why that would be hard to understand. I have people all the time assume I don’t like an album just because I don’t write about it. But sometimes you just can’t find the appropriate words for something. And all that said, I think “Stone Blind Horses” might be Ray’s best in the modern era. With you Conn. Ruffians is masterful to my ear. Why does everyone think that Satan is the ruler of Hell? Even educated atheists know that God is the ruler of everything, including Hell. Honky Honey, Atheism doesn’t do well in America, it’s has the least amount of believers here. You might as well equate yourself with an inanimate object, like a rock. But don’t do that! Atheism is more popular in China. You’ll have to spend a lot of time there to find out what atheists think they know. Ray W. clear says in his songs that when God is silent for you, you are doing the wrong things. That makes more sense to people who find themselves lucky enough to live their very short lives in this country. Funny, as much as Ray sings about God and Heaven, I would still be surprised if he weren’t an atheist. Or at least a pagan. You wouldn’t be surprised if he were a pagan or atheist, That’s because we usually project ourselves onto others. If Mr. Ray is selling to a specific groups of people, I would say one of those groups would be big-rig, cross country, truckers. People who spend 18-hours behind the wheel driving a load cross without a friend, staring at the road and the windshield. They have families and, more than not, have some sort of belief in God. While they are away for weeks on the road. Girlfriend stops to and from their destination is considered. They stay awake on coke and coffee, they smoke a lot of cigarettes, trying to quit all the non family stuff… someday they will. The songs create images in their mind and tell a story that keep them thinking. They are fans. They also take with Willie Nelson, Merle, Hank and the others who are considered by them, to be an actual person and not a character. I can think of a few more specific types of fans for this type of music who thinks he is a real person. Probably not his real name either, he wears a costume and the voice he uses on tour isn’t his own. He’s probably writing music for Luke Perry on the side to make more money. Maybe RWH comes out of the gimlet-eyed church of Christ, you know, the one without rose-colored glasses about humanity. Like where this comes from: “A true opium for the people is a belief in nothingness after death — the huge solace of thinking that for our betrayals, greed, cowardice, murders we are not going to be judged” (Czesław Miłosz). Who said I was an atheist? I was just pointing out the delusional idea most people have, that Satan rules over Hell. Atheism is not a belief. It’s an understanding. Or, if you prefer, a complete lack of all other beliefs. What do you call someone who doesn’t believe the universe is resting on the back of a turtle? If you don’t already do so, follow Ray on Facebook. Witty writing about his life on the road, his shows and his family. Good stuff…. I frigging love Ray. I met one night in Austin at The Grove and he’s one of those few people who’s as cool in person as you hope they’ll be. Make no mistake, I love RWH. He’s from a generation of Texas singer-songwriters we won’t see the likes of again. That being said, sometimes lately, as in listening to this new album, I find myself thinking Tony Joe White wants his act back. I also know you touched on the lyrics-for-gearhead issue in your review, Trig, but I just gotta say something else about it – and this is from a gearhead that knows what an ES-335 and a VOX AC30 are. He’s not only falling into self-parody, he’s venturing into hip-hop meta territory. I always found it ridiculous how hip-hop artists (and Bocephus and DAC for that matter) have to say their own name in virtually every song, or curiously mention the year the song the song was recorded in, instantly dating it. (“Yeah! 2017! What up?”) This was the feeling I got listening to “Open G”. I already know how to tune my guitar that way. It one of my favorite tunings, but why is telling us how to do it in song? And in such an unwitty way? I’d rather hear Keith Richards or Ry Cooder sing about that if it needs to be sung about at all. I just think RWH is capable of so much more than about half of this album. The other half is very well done, though. So you sent me down the Tony Joe White you tube wormhole and I got swampy and of course, listened to a couple of versions of Polk Salad Annie but I cannot see much more commonality in their “acts”…help me out with that comment. And Glad TJW and RWH are friends or maybe we would not have had Mother Blues….”Katie: Describe your relationship with Tony Joe White. RWH: I met Tony Joe in Taos, NM when he was doing a movie back in the early 70’s I think. He liked my songs and produced a demo session for me at Sun Studios in Memphis. We just kinda hit if off and I can make him laugh which makes me laugh. Both artists have been on a similar path. Of course, RWH’s “Redneck Mothers” is the same as Tony Joe White’s “Polk Salad Annie”, as in they are both known for their biggest “hits” (although Jerry Jeff had the hit with the RWH tune and Brook Benton had the hit with Tony Joe’s “Rainy Night in Georgia”) while making a fine career making great music for decades. It’s that TJW feel that RWH is going for in a lot of his songs nowadays, informed by a little Lightnin’ Hopkins, of course. But listen to “Lucifer and the Fallen Angels”, or “Dead Thumb King” and then check out any of TJW’s beyond “Polk Salad” – “The High Sheriff of Calhoun Parrish” https://youtu.be/CYbWAwj3Krc or any of his tunes Waylon covered, including “Goin’ Down Rockin” https://youtu.be/Ob5QsYlMDFw . And yes, I agree. I love “Mother Blues”. Hey thanks. Already got to some of that. Will continue to do the side by side because I am not seeing/hearing it. I think of ‘dust in the chase’ or some of the finger picking tunes that Ray does and it seems quite different than TJW’s act. The country blues cousin thing I hear but looking for closer kin than that. Thanks again. Saw Ray tonite in Fayetteville Arkansas. He put on a hell of a show. Thank God for dudes like this that keep true country music alive. Love the new record and your review. I’m a RWH fan but not crazy over new album. I need to be careful because plenty of times a cd can grow on me. Honestly had trouble getting through the first two songs. I love Lucinda and Ray though. Incredible song. Thing about RWH is that you can’t tell someone about his music, you can only talk to people who have heard it. How do you review an album without knowing the context of his entire body of work..? It’s like judging the Bible based on a Psalm. Spend time with everything you can find (except for the damnable Cowboy Twinkies, because that was not Ray, and if you didn’t know that you need to keep digging). I hope the Snake Daddy outlives me, so I can go into eternity not knowing how the story here ended. How many writers, singers, grifters or outlaws can you say that about?